In our Italian classes no matter what the student age is, we never just sit on a chair but we offer a variety of activities so that our students can move. We believe that learning takes place when we feel free and relaxed. This is why movement is important in our classes. Even in our adult classes we carefully select games to consolidate vocabulary and structures learnt. Adults move in class during the games, during ‘mingling’ activities, and they are sometimes invited to the board to take ownership of a particular activity. Movement is even more important in our children classes. Children unlike adults have a short attention span, albeit which grows with age. We account for this in all of our classes. For example our 3-5 classes are taught mainly on the carpet. However, children are invited to stand during singing time, they can move around during our role plays (picture 1.) and during games. 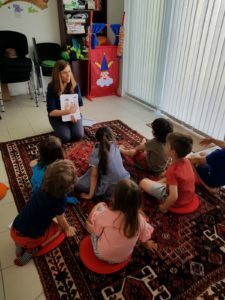 Because the class is varied and time standing/moving/on the carpet is alternated, when it is time to listen to a story in Italian or to work on activities that require attention, children are able to sit, listen and concentrate (pictures 2. and 3.). Storytelling is a very important element in our classes. 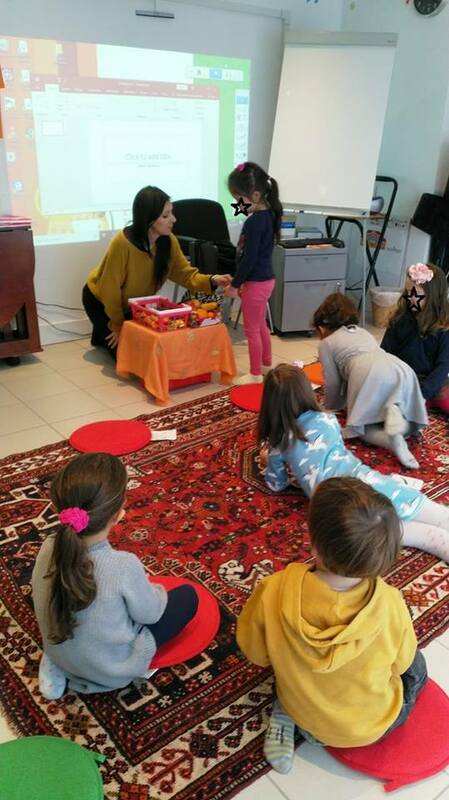 Our storytelling time is always interactive, so children are asked questions – always in Italian – and they are invited to participate actively in it. All our classes at all levels and for all ages are taught exclusively in Italian and students are interacting with our teachers in Italian. As the children grow their attention span grows and they are more able to sit still for longer periods. Students in our Italian 7-9 class, have a chair with a table as they are asked to write in some of the activities. Activities however, are varied and students are expected to move during some of the activities. 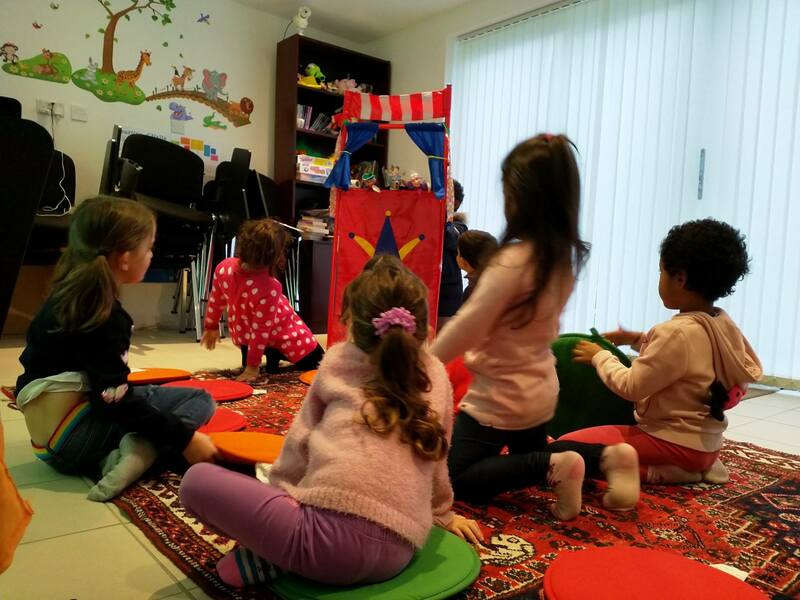 For example we offer time to work in pairs or in small groups on the floor (picture below) as well as standing time; for example time on the board during a game, a mime activity and so on. We are proud to announce our new Complete Beginner’s course in Central London EC1. Our new class will be located in the old Italian quarter in Clerkenwell. Clerkenwell has been home to the first Italians who came to London. They settled in the Clerkenwell area of London from 1800 onwards. 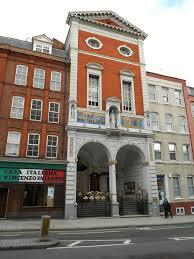 When St Peter’s Italian church was established in 1863 Clerkenwell became the focus of the Italian community in London. Next to it ‘La casa Vincenzo Pallotti’ provided the Italians with a club to socialise in, a school of Italian for the children and so on. Today ‘La casa Vincenzo Pallotti’ is still very popular with the Italian community in London, so we thought what better place to establish our new complete beginners class for adults than in this historic place. The club is strategically located near Farringdon and Chancery Lane tube stations. What can you expect from our classes? At Parla Italiano we believe that learning a language is all about motivation and fun. The role of our teachers is to guide you and make it possible for you to learn. Our teacher are qualified and prepared, they are able to make the learning process simple and achievable. Our classes are small, you can expect interaction and speaking from lesson one. Speaking and all the other skills (listening, writing and reading) are developed in each lesson and grammar is introduced gradually. After one term of classes you should be able to talk about yourself, ask basic questions, order at the bar and at the restaurant, express preferences and so on. The atmosphere in class is positive and encouraging. Mistakes are considered part of the journey. And most importantly, you should have fun while learning. Our complete beginner’s classes starts in April in Central and North London. Our locations include Clerkenwell, Finsbury Park, Palmers Green and Barnet. Our school of Italian for adults is growing fast and we are opening classes in various locations. We have classes at various levels in Palmers Green N13. We also have a class in Barnet EN4. We are excited to announce that – just after Easter – on 23 April we will be opening a new complete beginner’s class in Finsbury Park N4. This class is five minutes distance from Finsbury Park tube station, railway station and bus station with many buses serving the area. Our teachers are all qualified to teach Italian as a second language and mother tongue. For our complete beginners class no previous knowledge is required. If you have studied before, please get in touch by phone (07941 092593) for an assessment. Our courses include ten classes for a total of 15 hours. Our students often ask us what happened if they miss a class. To miss a class is not a problem as we always send some material to cover what has been done in class. For more information please visit our website: parlaitaliano.co.uk or phone Laura on 07941 092593. However, nowadays, it is actually the Italian language that is absorbing more words from English, for example from the technology and business world. And Italians are embracing the English words with open arms. Latte – In Italian this word means milk so when ordering a coffee, if you wish for a milky coffee it is better to order a ‘caffè latte’, to avoid being served a glass of milk. Panini – In Italian this is the plural noun of ‘panino’, which means bread roll, rather than grilled sandwich. In Italy order a ‘panino tostato’. Pepperoni – In Italian this word does not exist. ‘Peperone’ is a similar word, however this is not a spicy sausage but a sweet pepper. When ordering a pizza, order a ‘salame piccante’. Bolognese – This means ‘from Bologna’ but the meat and tomato sauce you are looking for is actually called ‘ragu`. Prosciutto – Prosciutto is both cooked ham (prosciutto cotto) and also cured (prosciutto crudo). Al fresco – This means ‘in a cool place’ but does not mean outdoors. If you wish to be outside, better say ‘all’aperto’. Funnily enough, ‘finire al fresco’ means to end up in jail. Confetti – This is actually a false friend. In Italian confetti are sugared almonds and are distributed to family and friends in special occasions such as weddings. The pieces of colored paper are called ‘coriandoli’. Have you ever thought how great it would be to start learning a new language, but never really did anything about it? Perhaps you felt it was daunting or thought that you were never good at languages at school. Perhaps you have tried and have been disappointed. At Parla Italiano we believe that learning a lang uage is all about motivation and fun. The role of our teachers is to guide you and make it possible for you to learn. Our teachers are qualified and prepared, they are able to make the learning process simple and doable. We have been teaching Italian for more than a decade and the new methodologies enables people to learn quicker, to really speak the language and even to speak from lesson one. Long gone are the days when you needed to learn by heart words and conjugations without ever using them in class or even uttering a single word. You don’t necessarily have to hop on a plane to feel like an Italian this summer! London is bursting with Italian culture; amongst its many restaurants, events and art, there is no excuse for you not to practise your Italian language skills. Here are a few ideas on how to immerse yourselves in the language and culture of Italian London. On Sunday 22 July 2018 the streets of London’s EC1 will be painted green, white and red as the Italian community of Clerkenwell and St Peters Italian Church put on the greatest Italian show of the summer; known to the Italians of London as ‘Festa Italiana’ or Processione della Madonna del Carmine. A great place to meet other Italians and surround yourself by the sounds and smells of Italy. Try some delicious porchetta and wash it down with a refreshing summery Spritz! Don’t miss out. Summer is a great time to start a new book so make it an Italian one! The Italian bookshop in Kensington is an excellent place to browse and buy a quality Italian book or a graded one for less advanced students. They also host regular talks and book presentations so check out their events to add to your diary! Movie fans will enjoy a trip to Cinema Italia held monthly at London’s historic The Regent Street Cinema in Oxford Circus. Visit the home of Italian contemporary films in the UK where you can choose from a programme of summer films, events and documentaries. Fancy your aperitivo in art form? then drop into the Estorick Collection in Canonbury Square N1, for a history lesson about one of Italy’s most celebrated drinks brand – Campari. ‘The Art of Campari’ exhibition, which is on until September, showcases the best of the brand’s rich heritage in creativity and design, you’ll want to sip on one after this! If you need to spice up your language skills why not sign up to our adult Italian courses for September. 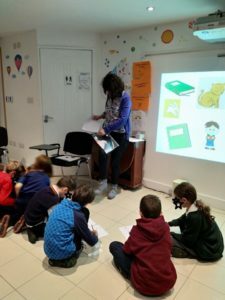 Or if you would like your children to learn, then it’s not too late to enrol them to our new Italian children’s classes in North London. In language learning, no matter where you start from, you can achieve your goal if you believe you can. Looking at what the most successful learners do can be inspirational. This is very much true for anything one wishes to achieve. To be proactive means to take ownership of ones’ own learning. The best language students are all independent students. They don’t expect to simply follow the teacher’s direction but have their own strategy for learning. They pick up tips for learning, look for ideas everywhere and develop their own strategy alongside the work they do in class. Highly effective students understand that exposure to the language is one of the most important elements. So they read and listen a great deal more than the average student. They use a variety of tools. The very best students work online, interact in groups, on pages, use website, apps etc. to help them develop their vocabulary and language skills. They are not afraid to speak. Speaking a language can only be learnt by speaking it. They find opportunities and make the most of them. Abandon perfectionism, the best learners are not afraid of making mistakes. They know it is part of the process of learning. Highly effective learners know that learning is not a linear process. The secret is to keep going and practise, practise, practise. Last but not least, when the game gets tough they don’t abandon it but they keep going, knowing that it will get easier. They trust themselves and the process. The fundamental elements of learning a language are only a few: being exposed to it by hearing lots of it and putting it into practise by speaking at any opportunity are two of them. But the most important is a fearless and trusting mind. When I was at school, I studied German for years, however, the only phrase I can say is ‘und so weiter’, which means etcetera. But why after so many years can I only say such a useless phrase? This is because it is the only phrase that my teacher used to say in German when teaching us. We never got to hear much German nor did we speak it in class. These are clearly great disadvantages when learning a language as hearing it continuously in context underpins learning. Speaking it is another pillar of a successful methodology. Our adults and children classes are taught in the target language and are given plenty of opportunities for speaking. Children, unlike adults, are less preoccupied with understanding every single word, so long as they can follow the general meaning, they will be interested. Their attitude generates a virtuous circle, the more they hear then the more they understand. This is the natural way of learning our mother tongue. Context is most important, for example, if the child doesn’t know what the word ‘apple’ means, if the parent holds an apple in their hand as they talk, the child will learn the word. Adult learners have the same ability but most tend to question and focus on what they don’t understand. They demand to understand every single word and feel lost when they don’t. In the previous example, they hear a sort of ‘bla, bla, bla, mela’ and rather than focus on the meaning of ‘mela=apple’ which is clear from the context, they focus on the ‘bla, bla, bla’. This becomes exhausting and ineffective. Successful adult learners trust themselves and have a mental openness similar to that of children. They are fearless and let the language soaks into their mind, capturing the essentials and more. If you are interested in learning a language, let the children teach you to be fearless. Children’s brains are designed for learning and they are natural at learning languages. Find here three simple steps to help them. When it comes to languages children are like sponges, they are able to learn simply by being in the environment where the language is spoken. Even when living abroad, if both parents speak their mother tongue, at home, the child will speak it as well. So they are natural learners and learning languages have huge benefits for them. But what about those children who are not raised in a mainly bilingual environment at home? Are they doomed? Of course not! To enable them to learn, children need enough exposure to the language and the right type of exposure. A class is a good way to start. In this setting, the language needs to be presented in context, for example with a story, with a task, with a game, etc… The class must be fun. Let’s be clear here, fun in class is not a desirable element but is essential, without it the children will switch off. Moreover, the language needs to be perceived as useful by the child. The skill of the teacher is to make those tasks/games/etc, irresistible for the children, so that they can’t wait to get stuck in. Although children’s brains are designed to learn and especially to learn languages, we also need to recognise that learning is an effort for the children, especially if they cannot rely on it being spoken continuously at home. So they need to be well supported in their endeavour. Parents needs to be aware that learning a language is a commitment for both the children and themselves. To learn a second language takes time and it takes dedication for children and families. It happens but not overnight, so be patient! At Parla Italiano, our school of Italian in Palmers Green, we strive to understand the process of learning so all the activities that we design reflect all of the above and more. Please visit our school if you wish to see our teachers in action or write to us to find out more about how we teach.